(Honolulu) -The National Wildlife Research Center (NWRC) of the US Department of Agriculture has provided the Department of Land and Natural Resources (DLNR) with a final report of its monitoring efforts relating to the presence of diphacinone, an anticoagulant rodenticide, used as part of an effort to restore native species habitat on Lehua Island. The multi-feed bait containing the rodenticide was applied to the island in August and September 2017. This is an attempt to eradicate invasive rats from the island and increase reproductive success for native birds and plants. As part of an independent environmental monitoring program, NWRC collected samples of seawater, soil, crabs, opihi, fish, and birds for several weeks following the application of bait. Samples were analyzed by NWRC scientists for the presence of diphacinone, the active ingredient in the bait. Diphacinone was selected as the primary eradication tool for use by the project due to its relatively low toxicity risk to individual non-target species (i.e. any species other than rats). The final report from NWRC validates the Environmental Assessment’s (EA) analysis that environmental impacts would be limited, short-term and would involve minimal non-target mortality. The EA and other permits required for the project anticipated and authorized an anticipated but nominal amount of bait ‘drift’ into the nearshore marine environment; further corroborating effectiveness of the projects operational plan to avoid and mitigate risks to non-target species including marine life. In the report, NWRC documented no detectable levels of diphacinone in any sample of seawater, soil, opihi, and seabirds. Three (out of 12) crabs contained detectable levels of diphacinone immediately following rodenticide applications, but no diphacinone residues were found two weeks after the final bait application. Diphacinone has been documented to have virtually no effects on invertebrates. Fish samples were analyzed for diphacinone contents in muscle tissue and liver. Three (out of 46) fish had detectable levels of diphacinone in the muscle during the applications, but no residues were found two weeks after the final application. In liver samples, diphacinone residues were found in 12 (out of 16) samples during the applications, but only two samples had diphacinone residues two weeks after the last application. Shorebirds were expected to be at higher risk of primary exposure given their feeding behavior. Since they are migratory birds, the project mitigated exposure of shorebirds to the rodenticide by timing the operation before most of migrant birds arrive to Lehua in the fall. Of all bird carcasses collected by the Lehua project team, two ruddy turnstones (Arenaria interpres) and one Pacific golden plover (Pluvialis fulva) exhibited internal biomarker fluorescence and gross pathology (hemorrhaging) consistent with direct bait consumption. In addition to planned monitoring efforts, project personnel visited a large tide pool on the east arm of the caldera on September 5, 2017, after a public report of dead fish. Project staff found 45 small dead mullet-type fish and two dead immature boobies in the pool. All fish and birds were collected for analysis. All samples were in advanced stage of tissue degradation and three were sent out for analysis. Diphacinone residues were detectable in one sample, but contamination from exposure to the elements (rather than ingestion) could not be ruled out. Indicative signs of mortality due to anticoagulant exposure could not be identified. The fish and bird carcasses were found with a large amount of organic debris including seaweed that appeared to have been washed ashore by an unusually high tidal event. The DLNR and all the partners of the Lehua Island Restoration Project take the potential environmental risks of the use of rodenticides for rodent eradications very seriously. To our knowledge, this is the most comprehensive and methodologically sensitive marine sampling effort associated with any aerial rodenticide application to date. There were no substantial nontarget mortality events clearly associated with this operation, apart from plausible implication in the deaths of three shorebirds. Put into context, Lehua Island supports tens of thousands of seabirds of which a significant percentage of eggs, chicks, and adults were preyed upon by rats annually. No new rat predations of birds have been found since the final bait application in September 2017. Although test results demonstrated short term exposure to diphacinone in crabs and fishes, the presence of residues was short-lived, with very few detections persisting beyond two weeks after the last bait application. Sub-lethal exposure to diphacinone is relatively quickly metabolized, and residual levels following operations such as the one on Lehua are not likely to be biologically significant. The decline in residues is consistent with no additional aerial application of bait. 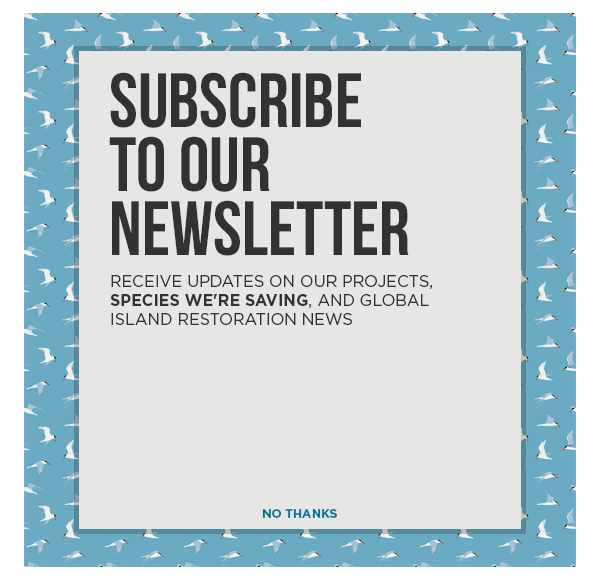 The partners involved in the Lehua Island Ecosystem Restoration Project continue to monitor the island for the presence of rats and for the recovery of native species. While native bird populations appear to be increasing, motion-triggered cameras have detected the presence of a small number of surviving rats on the island following the bait application. DLNR and its partners continue to use traps, rodenticide spot treatments and detection dogs with the goal of eliminating any remaining rats on the island.